I assume I’m pregnant. But in a disconnected, almost blasé way–I seem to have merged being in the wait with being in early pregnancy: it’s all tentative until it’s confirmed. So, I perceive some symptoms and yet catch myself moments before plunging into the hot tub (thankfully, L keeps hers at 98 degrees). I find myself going over my food consumption in retrospect, when it would already be too late. If I’m lucky, I will remember not to have a margarita after work. I like this new, disconnected merged feeling and hope it lasts. I feel like I’m right where I thought I’d be and wished I was on try #1, like, “Yeah, whatever, you know, it can take a while so we’ll see what happens.” Instead, I was myopic in the worst way, absolutely consumed with every minute detail, and now I think: yeah. Maybe sometime between now and the end of the year, *yawn*. I transported 3 vials to UCSF: one for October, one for November, one for December. And then we’ll celebrate a year since my big decision in the Grand Canyon and Rio-valuate. I find it intriguing that the photo is off-balance, because I was feeling off-balance. Stressed about work, mad and frustrated about my Good Match being so delayed, wondering when it’s all going to come together and make sense. 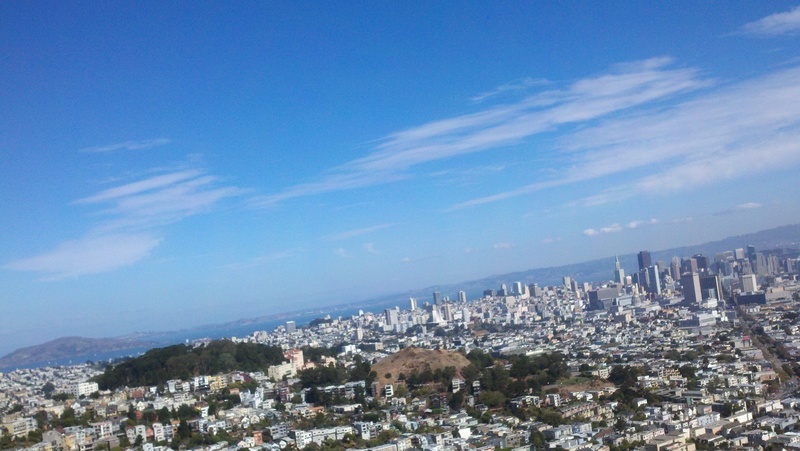 Being on top of Twin Peaks makes me think a lot about one of my exes. The walk down made me think about another one. I passed my therapists’s house. It sure is a journey. I got a mani/pedi. A hugely prego woman sat next to me and I vibed with her silently. I sat on the roof and wrote in my journal in the sunshine as the Blue Angels swooped around overhead. I bought veggies and made a delicious stir fry with quinoa. I listened to Pema, who always says the right thing. This time, it was to remember to cradle your poor anxious self in gentle lovingkindness. I decided to do my tomorrow self the enormous favor of setting out clothes, packing a gym bag, getting the coffee ready and the oatmeal and the vitamins. It was a nice gentle favor and my day was full, ending with another lovely tea with T. Now I need to do myself the favor of going to bed. I love this time of the month where my views start to skyrocket because you’re all checking for news. It makes me feel very loved and looked after, thank you. I will end with one last piece of news for which I am profoundly grateful: totally totally totally randomly, gay bf J will be back in town precisely when I will be testing, for the 3rd time in a row!!!!!! This is just cosmic. You couldn’t plan it. None of this turned out the way I expected, but you know what? I’ll take it. I always love when there’s a part from you in my inbox. J’ espere que tu fais de beaux reves maintenant, Mme Jeanne. xo. 🙂 Keep on keepin’ on….